It's true that I haven't posted here for a while. It's not that I haven't been eating or blogging (oh, I have), but I have cut back quite a bit on eating out this year. I guess the main reason for this is I've been wanting to spend a bit less money so that I can travel a bit more (my New Year's resolution for 2011, which I'll be reusing for 2012, was to leave Wellington at least once a month, even if it was just going somewhere an hour away). And in 2011 I did travel, to new places (Pakiri, Taranaki, Mexico, Melbourne) and old (Auckland, Singapore, Christchurch, Sydney, Chicago, Tokyo, Taupo, Gisborne). Now that I list it all I'm a bit astonished that I actually did all that. Also feeling incredibly fortunate that I was able to. But anyway. Most of my travels, rather unsurprisingly, had a heavy food focus, from markets to street food to cafes, restaurants and bars. But it's something I haven't really written about, mostly because food and travel writing doesn't fit neatly into my other blog, and I wasn't really sure whether Singaporean hawker centres and Mexican street food belong in a blog about the Wellington food scene. But you know what (besides "this is my blog, I can do what I want")? I like to think that eating new things when you travel informs how you eat at home. And maybe part of the reason why the culture of food is so strong in far-from-everywhere places like Wellington is because there are people who have shared what they've experienced somewhere on the other side of the world, whether it's a place from which they've come or just a place they've spent time in. And maybe that idea-sharing leads to innovation, and new and exciting and delicious things. Maybe. It's one possible way of looking at it. Or maybe it's my long-winded way of saying: in the future, you might see some posts about food in places I've visited. But what else has 2011 meant for me, and for Gusty Gourmet? Yes, I know. This app came out in October, and many of you may already have it. 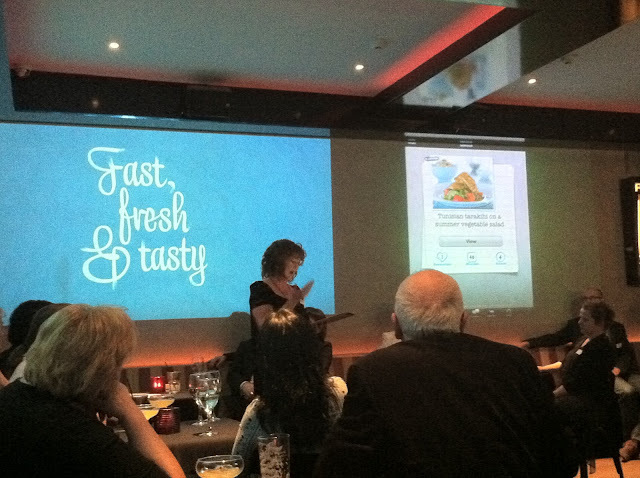 But in case you don't, here's a quick recap: Fast, Fresh & Tasty is a recipe app for the iPhone and iPad. It's different from the other recipe apps out there in that it's (hooray!) made for New Zealanders, featuring local ingredients (I love that it features New Zealand fish, for example) and with seasonal updates for Southern Hemisphere seasons. Plus it's relevant to this blog in that it was developed by the Wellington-based interactive media company Click Suite. And it's always cool to see Wellingtonians doing cool things, especially food-related. 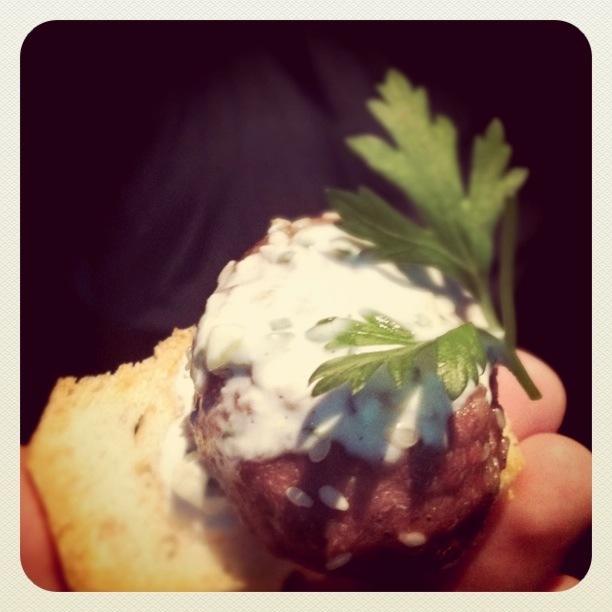 The venison meatballs with tzatziki sauce were flavoursome and made for great finger food. The recipe looks simple, too - one I'd like to try at home. 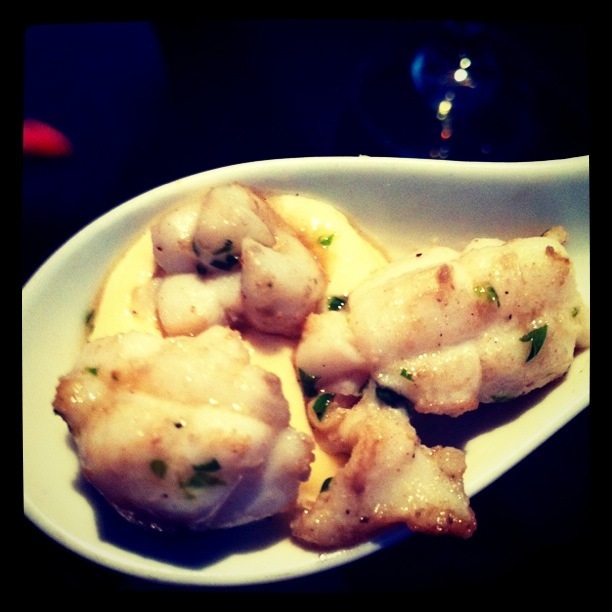 The somewhat blurry photo above is of salt and pepper squid with garlic aioli and caramelised limes. This was so good, and one I'll definitely be making this summer: the squid was delightfully tender and well-seasoned and I couldn't help but go back for more and more. The other exciting event I was lucky enough to attend recently was back in November - the Bees Blessing launch party at the Empire in Petone. Bees Blessing have actually been around for a few years now, and are a mainstay at the Harbourside Market on Sundays (along with other local markets on other days, it seems). But this event was a celebration of their new (gorgeously adorable) branding for their range of natural, honey-sweetened cordials. I'd tried a few Bees Blessing cordials before but always as cordial, just mixed with sparkling water. The coolest thing about the launch was seeing all the different possibilities of using these cordials, from cocktails to ice cream to marinades to salad dressings and more. In one corner there was a cooking demonstration by Adam, a wwoofer at Ian and Jo (the forces behind Bees Blessing)'s farm who just happens to be a chef (and now has his own blog!). Naturally I hardly left this corner, and got to sample Adam's creations. 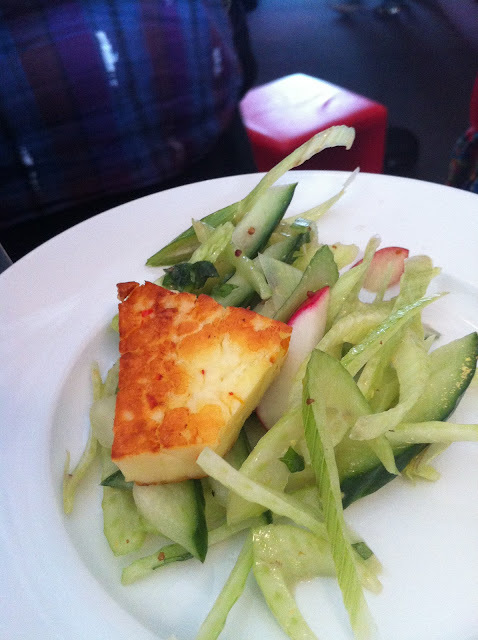 This was a favourite: an apple, fennel and radish salad (I love radishes!) dressed with a vinaigrette made from Bees Blessing Cider Vinegar & Honey cordial (easily my favourite cordial anyway - so versatile), served with halloumi. Very crisp and refreshing. 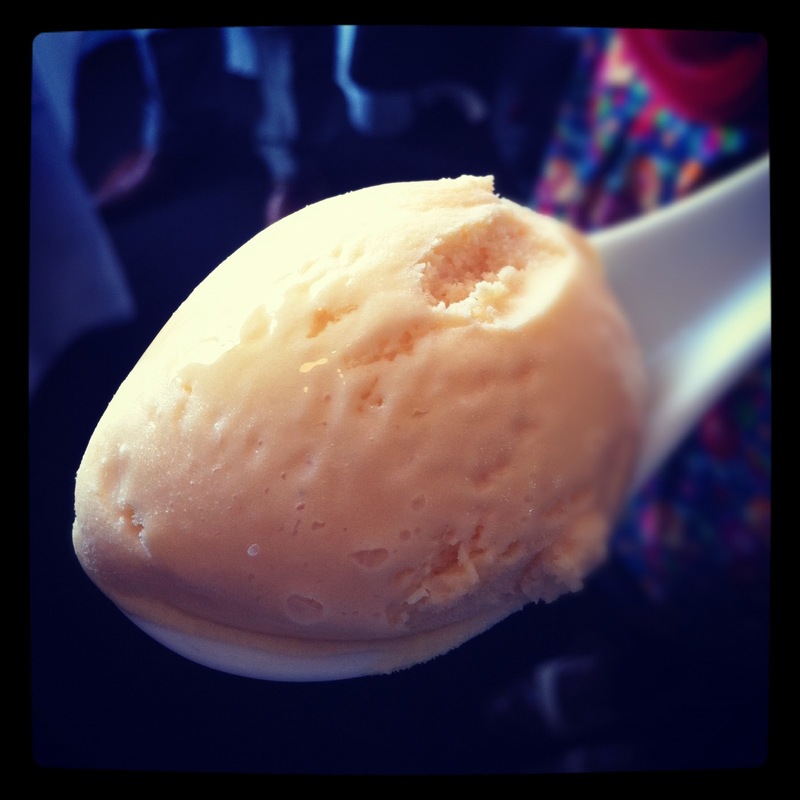 And I couldn't get enough of this ice cream, made with Bees Blessing Lemon, Honey & Ginger cordial. It was so smooth and delicious - I'd love to try making some at home. 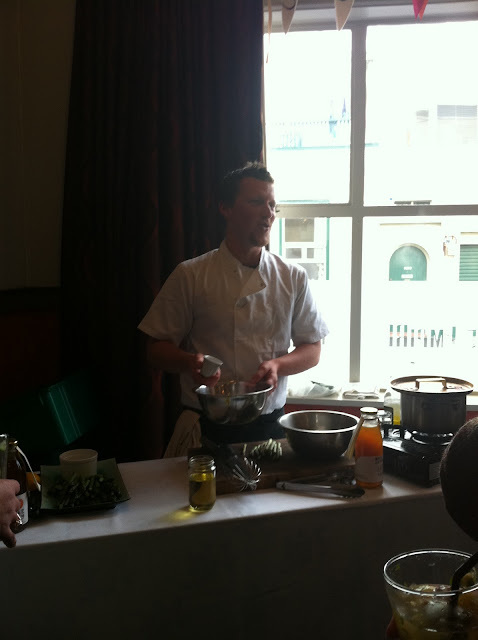 Wellingtonians doing cool, food-related things! I love it. *if you are reading this before Christmas there are still a few opportunities for you to get your hands on some Bees Blessing cordials: they'll be at the Kapiti evening market from 3-8pm on Wednesday, 21 December, at the Hutt Night Market on Thursday, 22 December from 4:30-9pm, and at the Paraparaumu Beach Market on Saturday, 24 December. (These details from Bees Blessing's facebook page). Plus I believe you can get these cordials at Moore Wilson's. Leave a comment if you've seen their products anywhere else! Ahh I wish I was back at that launch eating the ice cream, it was so amazing. You have done heaps this year & I for one would love to hear all about your travels & eating, of course!